Read here about scaffolds and their role in building and understanding tensegrity structures. Scaffolding is a temporary structure used to support people and material in the construction or repair of buildings and other large structures. It is usually a modular system of metal pipes or tubes, although it can be made out of other materials . Scaffolding is typically rigid, and loads carried by scaffolding are carried compressionally. Examples of scaffolding to support the construction of tensegrity structures are featured below. In all of these examples, neither the scaffold itself nor the structure that is produced with the aid of the scaffold are tensegrities. In other words, the object being constructed is not a tensegrity while the scaffolding is in place. This will likely always be the case when scaffolding is used to construct a tensegrity. In molecular biology, molecular chaperones are proteins that assist the non-covalent folding or unfolding and the assembly or disassembly of other macro-molecular structures, but do not occur in these structures when the structures are performing their normal biological functions having completed the processes of folding and/or assembly. Such chaperones play the role of scafflding as defined here. Note that scaffold proteins do not play this role--that term is reserved for neurological signalling proteins. 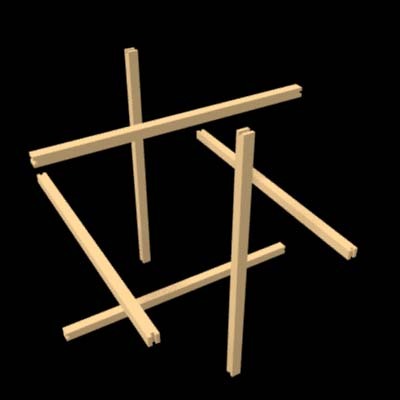 Below are two computer images of a 6 strut tensegrity. The first image shows the struts in place, without tendons. The second image shows the struts with tendons. A construction method using scaffolding would require the deployment of a scaffold to hold the struts in these locations while the tendons are attached. The scaffold would then be removed and discarded. In March 1965 Fuller filed for a patent on an automated tensegrity construction machine. The patent was rejected after a second filing. Called the octa spinner, it proposed an automated process for producing 3 strut tensegrities. Scaffold for a 3 strut tensegrity. From Fuller's patent application for an Octet Spinner, Figure 6"
Scaffold for a 3 strut tensegrity. From Fuller's patent application for an Octet Spinner, Figure 4"
Tensegrity Factory by Phil Earnhardt relies on a scaffold to construct a 6 strut tensegrity. See tensegrity-factory.com. The cube is relatively small with a groove on the center of each face. A strut is positioned in each of those grooves. A pair of velcro straps would secure two parallel rods to the cube. The length of a side of the cube would be about half of Connelly's cube scaffold (below). After that third pair of straps are removed, the cube will be disassembled. The red lines show where the cube is made of three separate slices that separate after the dark blue straps are removed. Cube-shaped scaffold, cutaway view of struts without tendons, by Phil Earnhardt, tensegrity-factory-com." link: http://tensegrity-factory.com/"
The drawing below shows assembly after the lines have been threaded and crimped at the end-points. The struts are all resting in semicircular grooves cut into the faces of the cube. There were three pairs of straps wrapped around the yellow cube; the first two pairs have been removed. The third pair of straps are dark blue; they have been securing the green struts to the cube. Cube-shaped scaffold with tendons applied by Phil Earnhardt, tensegrity-factory-com." link: http://tensegrity-factory.com/"
In Connelly's article, he shows a cube constructed of six stiff carboard sides. How to construct a tensegrity by using a cardboard scaffold: Construct a cardboard model of the target regular polyhedra. Bre, maker extraordinaire: founder of Make Magazine and inventor of the Makerbot 3D printer posted video instructions for constructing a 6 strut soda straw tensegrity at http://www.youtube.com/watch?v=96kz98yEO1w . The procedure relies on six rubber bands applied as an intermediate, flexible tensile scaffolding, to make the construction easier. 6 strut scaffold by Bre of Makezine. Bre mentions in the video that his father studied with Bucky and taught him about tensegrity in his youth. Art DuPre, math professor at Rutgers, recommends using scaffolds to construct tensegrity models. He have a video presentation in two parts, in 2012, explaining his approach. This page was last edited on 20 January 2019, at 08:30.